Theft of and tampering with electronic cardholder data during an otherwise legitimate transaction is big business, operated by an international criminal enterprise that typically uses sophisticated, virtually undetectable “skimming” devices to compromise your security systems. Unless you take strong countermeasures to protect the physical security of your POS hardware and software, you become an easy mark. That’s why our custom payment terminal stands offer the strongest protection against product tampering, system compromise and skimming schemes. With an attractive design and small footprint, Ingenico Group stands provide operational flexibility and versatility while protecting your brand identity and integrity. To bring you a range of products mounts, to help secure your payment device, Ingenico Group has partnered with three companies, each well-established internationally, to serve as our stands manufacturers. As of July 1, 2015, a new PCI DSS v3 regulation is in place. The easiest way to comply with the regulation is to lock down all payment terminals. These stand options all offer a range of lock options to enhance security, and to meet the PCI DSS v3 mandates. A range of all steel construction stands is available from our partner, SpacePole Inc. 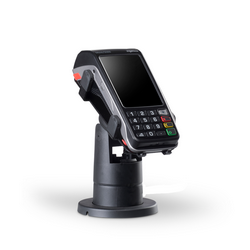 These feature a common tilt and swivel base with a range of Ingenico Group product carrier plates that may be positioned on the base by the customer to suit their use case. Glue pads are available as an accessory for the least invasive lock down option. A range of non-articulated, fixed angle wedge stands are also available. Both stand types may be screwed or glue-pad mounted to the counter-top. Glue pads and rubber feet are supplied with wedge stands. A heavy steel base is available for free standing applications. Kensington ClickSafe locks are available to provide additional security on all of these stands. A robust range of completely ABS/polycarbonate stands is available from our partner, Tailwind. These stands utilize a common tilt and swivel base which can accommodate an optional lock, coupled with a range of product carriers known as PEDPacks. The PEDpack attaches to the Ingenico product and “plugs into” the base. This provides a good platform for customers wishing to use a mixed product estate. 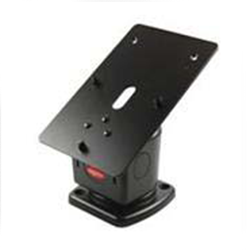 These are supplied with a glue-pad for screw-less mounting applications, and front handle to assist tilt and swivel articulation. The non-locking base is the FirstBase. The lock-equipped version is the SafeBase. We partnered with ENS to produce a rugged product stand unique to Ingenico Group. This partnership allows us to provide a range of converter plates to allow our products to fit in place of other products that existed before the merchants’ transition to using Ingenico Group terminals.